Do not fret! I am not suggesting you try to rock a turban, even though I am very aware of their return and think (if done properly) it can be an extremely stylish look. What I am suggesting is that you kick up your braid a couple of notches with a fun strip of ribbon. 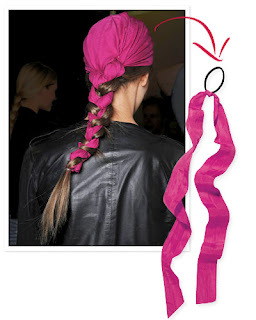 Braids are definitely of-the-moment, and this is a great way to add a little pizazz to your presentation. My note of caution: you want this to look pretty and neat, not like your little sister was playing with your hair. Make sure your braid is even and lays flat! Also, the thinner the ribbon, the easier it will be to pull off this look. Although InStyle does not show it in the picture, if you're having difficulty with making the end of the ribbon disappear, I would not hesitate to let the end of the ribbon dangle and cut it off so it is even with the rest of your hair. Of course, make sure you cut the ribbon on an angle to reduce fraying, and you might want to swipe some fray-check or clear nail polish on the end to ensure a fray-free wear. Here is InStyle's DIY instructions for this trick! Also, check out their fun ideas for barettes, a trend that started to grace the runways a couple of seasons back but hasn't transitioned as quickly to the streets.